A world completely inhabited by cats came across my eyes yesterday. 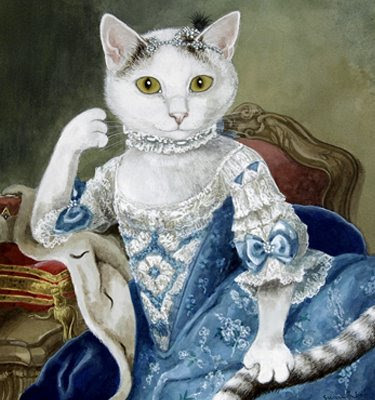 Susan Herbert, a painter who prefers cat models, has repainted a variety of known masterpieces, replacing the original models with cats, in pieces like Da Vinci's Mona Lisa, Marie Antoinette and many more. Some of her publications explore the Middle ages, Impressionism, Shakespearean drama, Western Art like Manet and Michelangelo, and also scenes from classic movies. 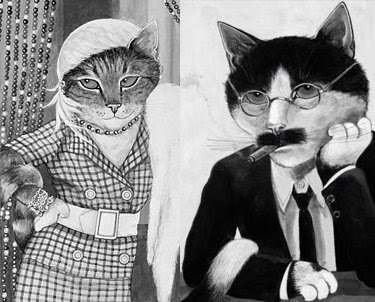 Her work has a funny, bizzare feeling about it without the atmosphere of the paintings ever feeling humorous. The cats' facial expressions are very sophisticated and serious most of the time. What I also love about her, is that she successfully reflects the specific movement, characteristics and techniques of the original artist but its also different at the same time too. 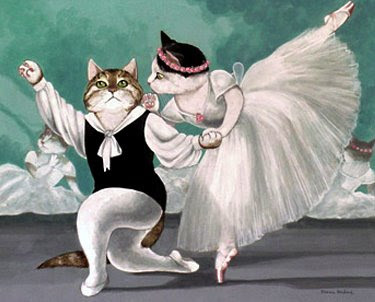 I couldn't find much of a bio of the artist, I only know she herself loves cats and her pet stars in the paintings quite often. See more of her innovative work at Chris Beetles Gallery. You "hearted" my portfolio, Made me very happy:) Liek the stuff you have here too! Its very inspiring!